Home › Running Tips/Blogs › Fleet Feet Beat › From an Owner's Eye: I'm Happy to Be Alive! This coming weekend is one of the larger race weekends in the Rochester region – the Rochester Regional Health Flower City Challenge – two days of events for all ages and abilities plus an Expo which starts Friday, April 28th at Fleet Feet Sports. A weekend where people travel from all over to conquer everything from a 20 mile bike, 3 mile paddle, 13.1 miles, 5K or even a ¼ mile for the littlest of athletes. “I’m Happy to be Alive”, says John Burke, 92 years young. Words said to me by John Burke this past weekend at the Rochester Heart 5K Run/Walk. 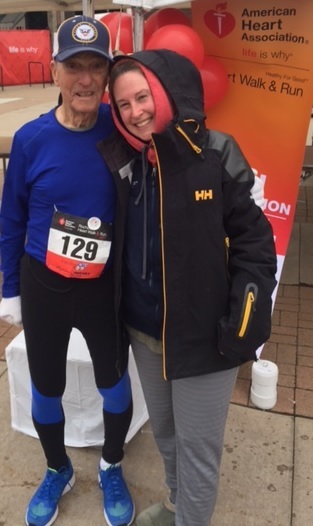 John Burke finished the 5K just under 57 minutes with a huge smile and turning to our YellowJacket Racing crew upon completion, “I’m 92 years old”. Ninety Two Years Old. Process that for a moment. How many of us know people who are over 90, let alone over 90 that are still participating in 5Ks. Process that for a moment…..which I did and immediately sought to find John so I could have a picture with him. What is my point? This coming weekend athletes will be testing themselves in their event, no matter what distance or specific event they are in. Athletes are going to have all kind of back stories, trials and tribulations that got them to the start line, just like John. But my hope for you this weekend is that when you cross that finish line you can enjoy the journey to get there and one of the phrases you can say is “I’m Happy to be Alive”, just like John.